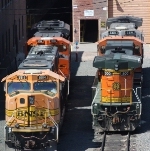 Description: BNSF coal train waiting to head west, sits alongside a Union Pacific stack train. Description: I think this train was detouring off the NS or BRC. Description: DPU pushing towards MERC and through LST&T Jct. Description: I think its time to move on to a color that wont do this..... Pretty nasty lookin'! Description: Westbound coal empties start down the curve in the tracks that leads to the Mississippi River bridge. Downtown Brainerd, Minnesota's historic water tower is evident on the left. Description: BNSF train Z-STPCHC zips along the Mississippi River near Genoa WI. Description: Paint job does not seem to held up too well. Power the track inspection, er, track management crew. Description: BNSF SD70MACs and an Ace on K688-23 in the snow at CP22! Description: This was the leader coming into Staples, but was pushed two second at request of the crew because it had no heat.